The sweet owner of Spearmint Baby saw my previous post on Ella's nursery and asked if I'd like to be featured on her blog. Of course, I would....so I sent in a few more photos of the room and today Ella's nursery is being showcased! Check out Spearmint Baby to see the feature and while there browse through the rest of the blog to get beautiful inspiration for your baby's room or next baby shower. 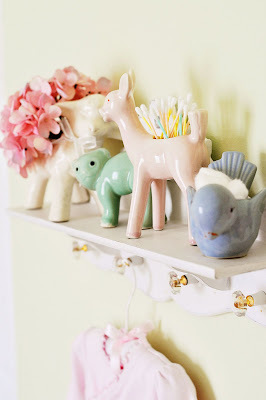 Be sure to check out her other blog, Spearmint Decor to get inspiration for the rest of your home! that is so fun! I love her nursery--you did a great job with it and I'm so glad more people can be inspired by you! Thanks for visiting my blog today! I love yours!! Very cute! That is awesome! Her room is adorable! You are so talented! Or should I say Sew Inspiring!